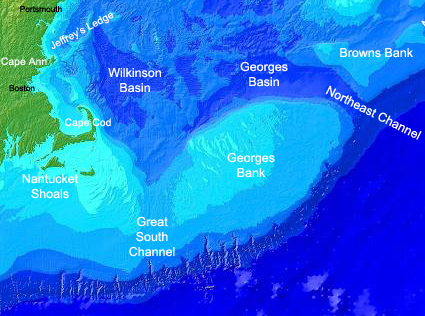 Georges Bank is a shallow offshore plateau, separated from Southern New England waters to the west by the Great South Channel, bordered on the north by the Gulf of Maine, and flanked to the east and south by the deep Atlantic Ocean. During the ice age, Georges Bank was above water – mastodon bones have been found in fishing nets. The short distance from surface to seafloor affords the Bank’s waters with a high degree of light penetration, making it a very productive area. It's temperatures are closer to those of Southern New England, but its mix of species includes both southern species as well as the northern species typical of the Gulf of Maine. Despite its position as a transition zone, studies show that Georges Bank is home to distinct stocks of many commercial species -- in other words, some groups of fish on Georges Bank do not interbreed with fish of the same species in these other two ecosystems. Nonetheless, scientists have long debated the precise boundaries of this zone, given the large degree of overlap in oceanographic conditions and species mix between Georges Bank and both the Gulf of Maine and Southern New England waters. In terms of its cultural identify, however, Georges Bank is all its own. The stunning biological productivity resulting from its shallow, light-penetrated waters has traditionally made it one of the world’s great fishing grounds. But that distinction, combined with market preference for certain species over others, has occasionally led to unstable fishing patterns. Intense fishing during the second half of that 20th century led to a series of changes in the fish community of Georges Bank (6). By targeting large, once-abundant piscivoes (fish-eating fish, such as cod and white hake and benthivores (fish that eat bottom invertebrates, including haddock and yellowtail flounder), fisheries induced a trend towards greater abundance of pelagic fish (fish that dwell in the water colum, like spiny dogfish and silver hake) and planktivores (fish that eat plankton, like herring and mackerel). Historical cod fishery. Credit: NOAA.